The proposed 'village' site on the former golf course at Flaxby. 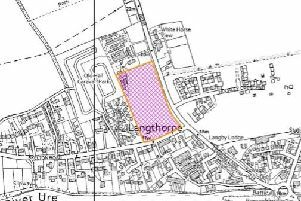 A decision on the proposed blueprint which will dictate the location of thousands of new homes and residents in Harrogate should be known in spring, following the completion of a month-long session of hearings. The final week of the scrutiny hearings finished on Wednesday, with climate change, heritage protection and environmental impacts among the issues discussed. Government-appointed inspector Richard Schofield, who has chaired the hearings since their start in January, will now undertake further public consultation before sending the final report to Harrogate Borough Council for actioning. A spokesperson from the Planning Inspectorate confirmed that the final report on the proposed bluebrint was expected to be completed in spring. The completion of the hearings comes as fierce debate remains around various proposals in the draft. Earlier this week, Harrogate District Chamber of Commerce voiced via social media their support for the location of a new village at Flaxby, as opposed to the council’s preferred area near Green Hammerton. Chamber CEO Sandra Doherty said that when it was put to the vote by the organisation’s management group three months ago, Flaxby was voted 18-1 as the preferred site. Ms Doherty said the chamber’s support of the Flaxby area was largely due to developers proposing a sooner starting date for construction compared to alternate sites proposed near Green Hammerton. “The fact that it will provide affordable housing for people wanting to work in Harrogate, with plans of a direct bus route to Harrogate,” she cited as reasons for the group’s support of it. She confirmed that the developers behind Flaxby had approached the chamber asking for letters of support, which the chamber supplied. “It’s not to say we woldn’t support the (area) at Green Hammerton if they asked,” she said. She said that the Green Hammerton site would have equal benefits for both Harrogate and York council districts, given its proximity to the historic city. “York’s got the exactly the same housing problems as us,” she said. The council have maintained throughout the hearings that the Green Hammerton area is more suitable given the existing links to rail and greater potential for growth. Other key points of conjecture remain around the “western arc”, specifically in regards to congestion in central Harrogate if 3,700 proposed homes are built around the south and the west of the town. These concerns were highlighted by the Western Arc Cooperation Group – made up of Pannal and Burn Bridge Parish Council, North Rigton Parish Council, Beckwithshaw Parish Council, Hampsthwaite Parish Council, the Duchy Residents Association and HAPARA – at the January 30 hearing. The cooperation group presented a report they had commissioned themselves into congestion around the west of Harrogate, while voicing their concerns that the collateral impact of the additional traffic had not been accounted for. The group also voiced concerns that mitigation tactics suggested by council, such as improved bus connectivity and road widening, wouldn’t be enough to stop gridlock at the site. Cabinet member for planning, Councillor Rebecca Burnett, said last week that all parties had had an opportunity to present to Mr Schofield, and council would await his report. “The discussions at the hearings, so far, have been wide ranging and we now await the inspector’s report to confirm whether our Local Plan is sound,” she said.